Woohoo, you've made it to the half way mark! 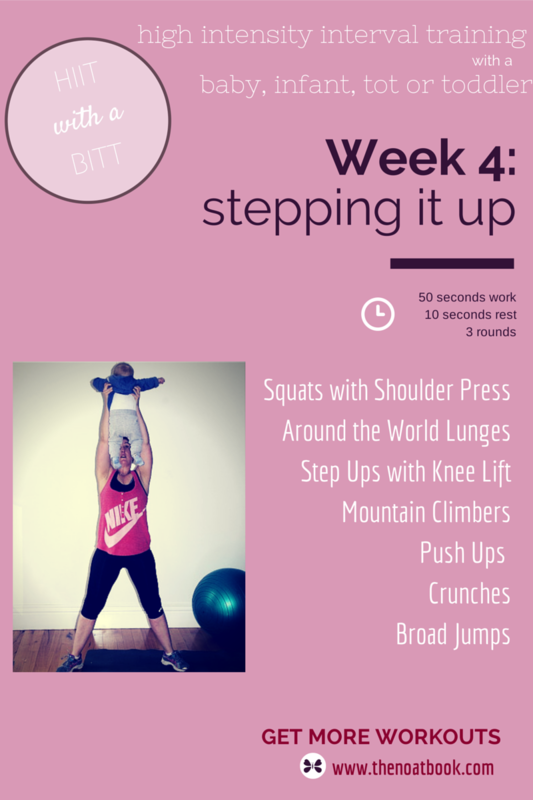 We are up to Week 4 of our 8-week workout series 'HIIT with a BITT' where it's all about working out with your baby at home. 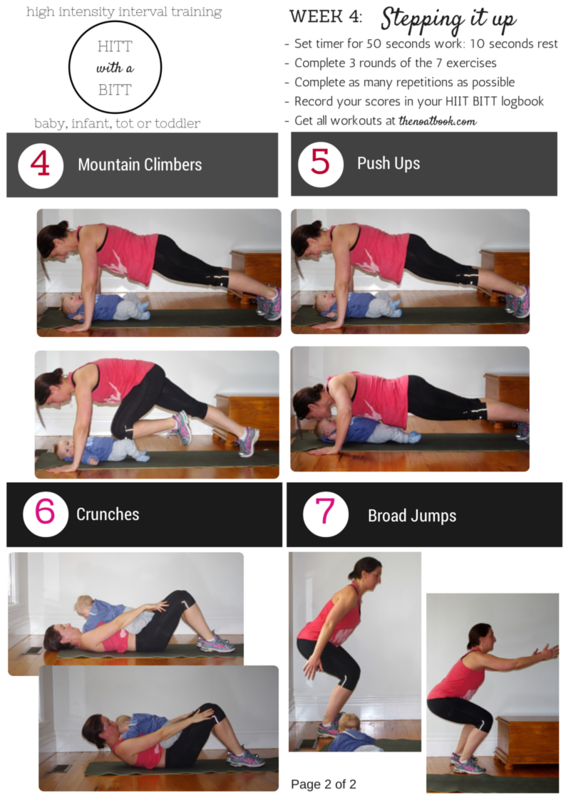 It takes 30 minutes and requires no equipment except for your beautiful baby. Complete your workouts 3 times a week and you'll get fit, fast! By Week 4 you'll be getting stronger and fitter so make sure you keep pushing yourself. This week you'll again set your timer for 50 seconds work and 10 seconds rest. 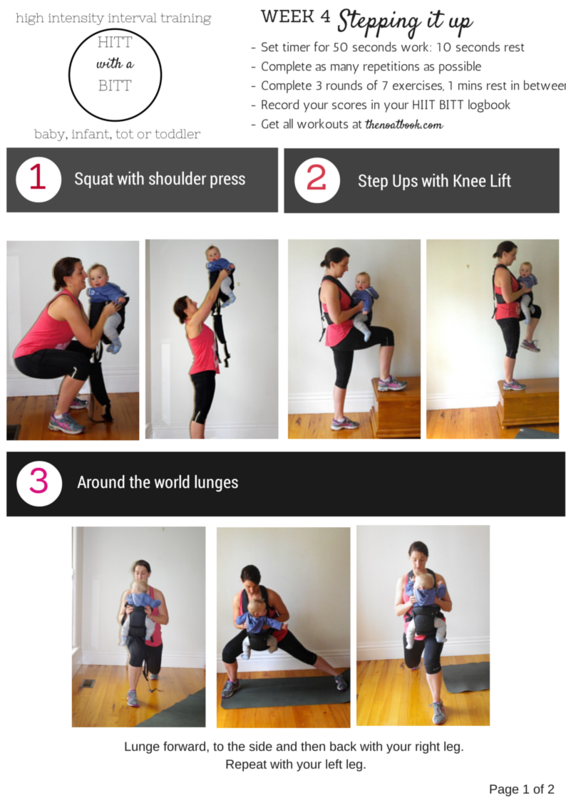 If you don't want to take your baby carrier on and off you can complete 3 rounds of the lunges and step ups, and then complete 3 rounds of the remaining exercises with the carrier off. Be sure to keep your bub in the carrier when you complete the overhead press as it will give you a safer and firmer grip that is also more comfortable for your baby. Try to always attempt the most challenging version of each exercise first. For example, try to always start doing your push ups on your toes, and then when you can't do any more, drop down onto your knees. Even if you only manage one push up, it is going to help challenge your fitness and you will see improvements much more quickly! Hold you baby level with your shoulder. Drop into a squat keeping your elbows ticked in and under your baby. Ensure you chest is up, your hips are back and your knees don't go past your toes. Keep your weight in your heels, you should be able to wiggle your toes throughout the entire movement. As you rise from your squat lift, straighten arms at the same time to lift your baby up over your head. Ensure you whole foot is placed on the step. As you step up with your right foot lift you drive your left knee up to 90 degrees. Step down with your left leg first. Alternate stepping up with your left and right foot. Make it harder: Use a higher step. Compete 50 seconds with your right leg and 50 seconds with your left leg, only tapping your toe down in between. Stand with feet should-width apart. Step forward with you right leg. You need to take a large enough step forward that allows you to bend both knees to a 90 degree angle. As you lunge ensure your take your knee straight down, not forward. You should be able to see your toe below your knee. Return to starting position and lunge to your right. Return to starting position and lunge backwards. Keep you abdominal muscles switched on. Make it easier: Return to a standing position in between each lunge. Make it harder: Keep low throughout the movements. Only tap toe back to the middle before completing next lunge. Aim to get your knee close to the floor with every lunge. Ensure your hands are placed directly under your shoulders. Your weight should be forward over your hands and you should be looking 30cms in front of your hands. Keep your abdominal muscles switched on and your hips down. Pull one knee up toward your stomach as far as you can go. Return your foot to the starting position nd complete with your other leg. Make it harder: Switch feet without returning you foot back to the starting position i.e. like a running motion. Start with your hands wider than your shoulders. Lower your chest until your elbows until they are in line with your shoulders. You don't need to get your chest to the ground as this can injure your shoulder. Keep your bottom down and make sure your abdominal and pelvic floor muscles are switched on. Lying on your back, bend your knees and bring heels close to your bottom. Place your baby on your chest or hips. Reach for your knees sliding your ribs towards you hips. Keep your eyes to the ceiling to help protect your neck. Lift using your abdominal muscles not your neck. Make it harder: Lift your legs so your hips and knees are at 90 degrees. Stand with feet should-width apart. Swing arms back as you bend your knees and jump with both feet as far forward as you can. Land with soft (slightly bent) knees. Jump 180 degrees to face the direction you just jumped and repeat. Make it harder: Aim for extra height and length on every jump.